How Much Will I Pay for Dental Implants? The more teeth you replace, the more you can expect to pay because several implant posts and abutments are needed. 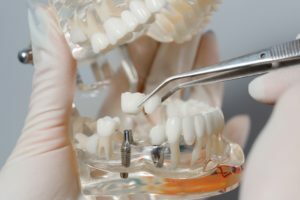 Although a single unit is cheaper, it is more cost-effective to replace several teeth with an implant-supported appliance rather than treating each one individually. Your dentist needs a CT scan and digital x-rays to assess the health of your jawbone and to determine the placement of your posts. Placing your posts requires surgery, so you will need sedation or anesthesia. It is common to need additional procedures before having your implant posts placed, such as tooth extractions, bone grafting, or a sinus lift. Often, the restorations are among the most expensive part of the treatment. You can expect the price to increase with each tooth that needs to be replaced. Do not let the price of the procedure scare you from completing your smile. Although they are more expensive upfront than traditional options, they are more cost-effective down the road. They improve your oral health to reduce your potential dental costs in the future. Not to mention, they can last for a lifetime, so you will never need to worry about having them replaced. To help lower the amount you need to pay, you can use your dental insurance. While it will not cover the entire treatment, it can help to pay for certain aspects until you reach your annual limit, like the CT scan and restorations. To cover any remaining balance, you can use third-party financing through CareCredit. Dental implants are the ideal solution to replace your missing teeth. You will invest in your quality of life with a treatment that closely looks and feels natural. Dr. David Hirshfield is supported by extensive training and qualifications in advanced dental procedures. Besides promoting the health of your natural teeth, he also offers the latest tooth replacement options, including dental implants. If you are ready to complete your smile, contact Hirshfield Dental Care to see if dental implants are right for you.